Cobalt is an amazing town to visit for local colours! A century ago it had a floating population of 12,000 people living in it, mined almost 1,000 tons of silver in a single year (30,000,000 ounces), and even had the cheek to dub Toronto as, “the place where you catch the train to Cobalt”. It’s a place full of stories and rare minerals. This summer Manny and I decided to visit Cobalt together. He was interested in going silver hunting, and because Reiner and Maggie moved up to Cobalt a year ago I knew we’d have a great trip. After we confirmed a few days that would work for our friends, we packed up all our gear the night before and got an early start on our eight-hour drive north. As the landscape changed, Manny’s excitement grew. The rocks, trees, and lakes of the Canadian Shield foreshadowed for him the rock-hounding to come. Arriving in the late afternoon we got set up in the Bunkie and took a tour with our friends around the area’s historic mines and buildings. The existence of these mining structures is part of the reason why Cobalt has been dubbed “Ontario’s Most Historic Town” and why today it is a designated National Historic Site of Canada. We visited head frames, milling foundations and even walked in an adage tunnel from the abandoned mines of Cobalt. It’s hard to express how impressive these ruins are, and how easy it is to enter the work and ingenuity of the people who created them. Standing on top of the Nipissing 404 High-grade Mill we experienced how impressive and important these industrial structures are. In Ontario, many of the old mines are being erased by burying these structures and their history in an environmental reclaim project. A reclaim that cleans up toxins from the earth is laudable, but it’s hard to imagine why that needs to also includes destroying the history of the mine. 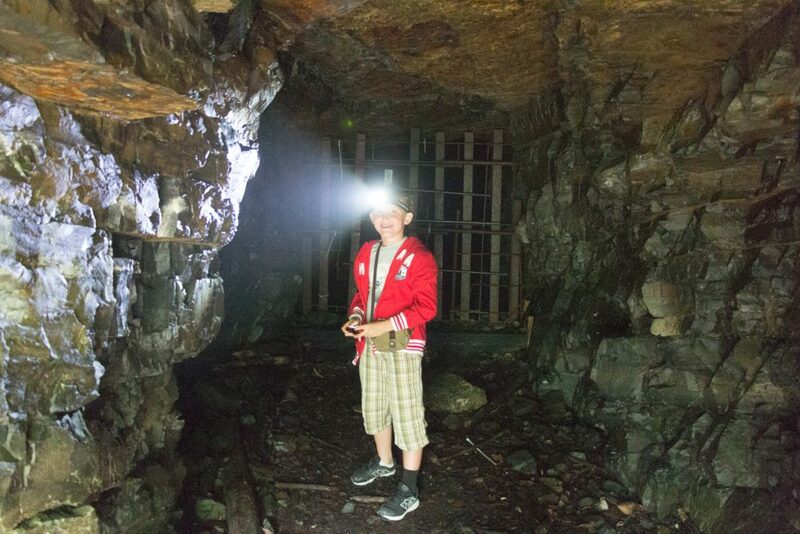 My son and I loved visiting the old mine buildings of Cobalt, and I have a new sense of the town’s history because of it. Rock pile where we foraged for asbolane in Cobalt. Tools used for foraging for asbolane. 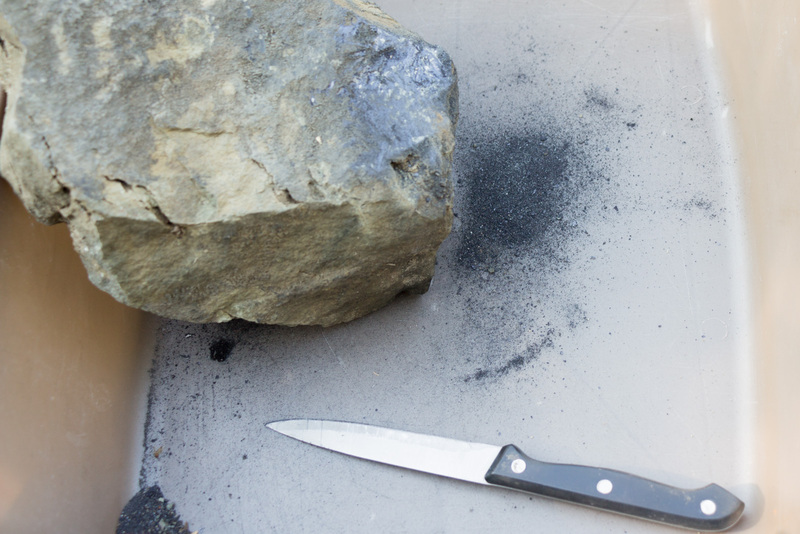 Scraping the coatings of asbolane off the rocks. The next morning, Reiner, Manny and I headed over to the Nipissing 404’s Vein 55 to collect a new pigment colour. Before we left, Reiner has sent me a note saying that he had found a rare, black mineral in one of the old mine dumps – asbolane. When powdered, asbolane feels smooth like graphite, but is a deep brown-black colour. It’s so rare in Canada that Cobalt is one of only two places where it’s found (and the other is up in the Northwest Territories!) However, it was only after we arrived that I realized how difficult collecting this rare local colour was going to be … The asbolane in Cobalt only exists as a thin coating on other rocks. 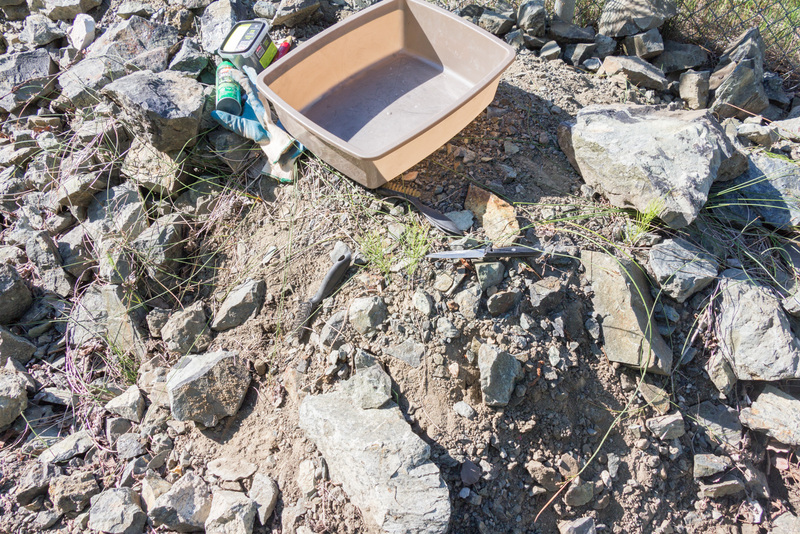 A thick example here is not even a millimeter, so as Reiner and Manny brought host rocks to where I sat, I scraped these coatings into a bucket. With enough bug spray, however, it turned out not to be a bad way to spend the morning, and I’m excited to see what kind of paint I can make once I’m back in my studio. Our big rock hounding trip while in Cobalt took us further north to Gowganda to look for silver. While Cobalt earned the nickname, “Silver City” back in the 1910s, many dumps have been reclaimed or are off limits today. Reiner felt sure that Manny would find silver if we headed up to Gowganda. The drive up was beautiful, with a large swath of farmland surprising Manny and I as we drove through New Liskeard. Arriving at the old mine we climbed up the hill and got to work. There were a lot of rocks and trash to dig through, and all the iron drill bits, bolts, etc. made it tricky to use our metal detectors. 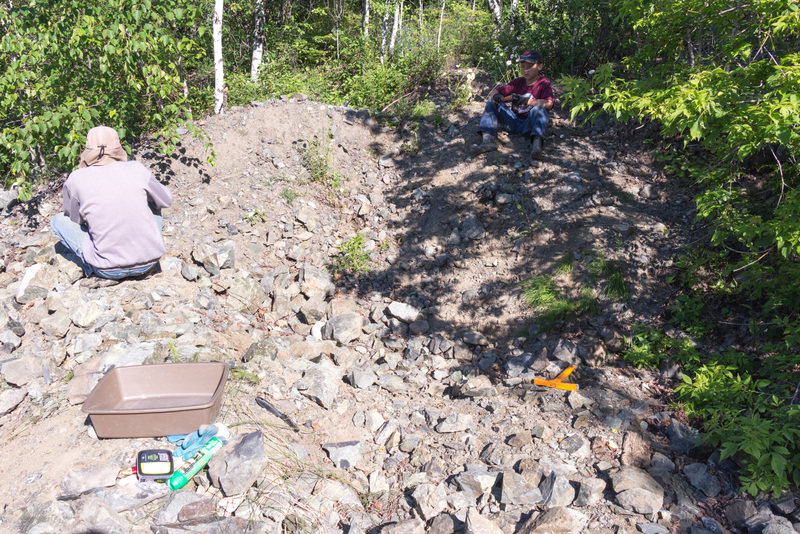 In the end, we simply dug out the rocks—stopping if one felt especially heavy and giving it a scan to confirm it had some metallic silver. The work was hard, but Manny kept digging. And, in the end, we found some rocks which we suspected were hi-grade silver. Cross section of hi-grade silver ore from Gowganda. When we got back to Cobalt that night, Reiner had one more surprise for us. He placed each of the rocks we had found in his rock-saw and cut them open so we could see what was inside. 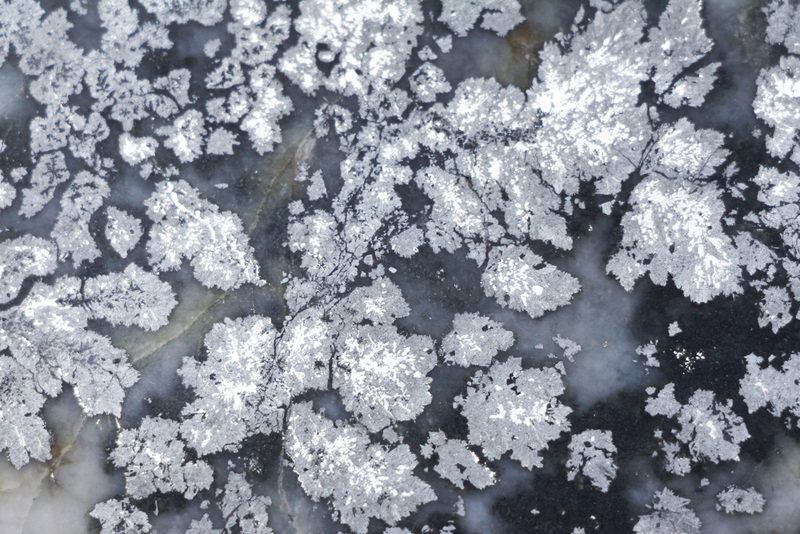 As we peered into each rock, we could see how the silver and cobalt had grown inside of it—creating beautiful patterns like frost on a window. Manny and I both took a half of our favourite rock, and I suspect we’ll treasure it for the rest of our lives. Packing up at the end of our trip rockhounding in Cobalt. 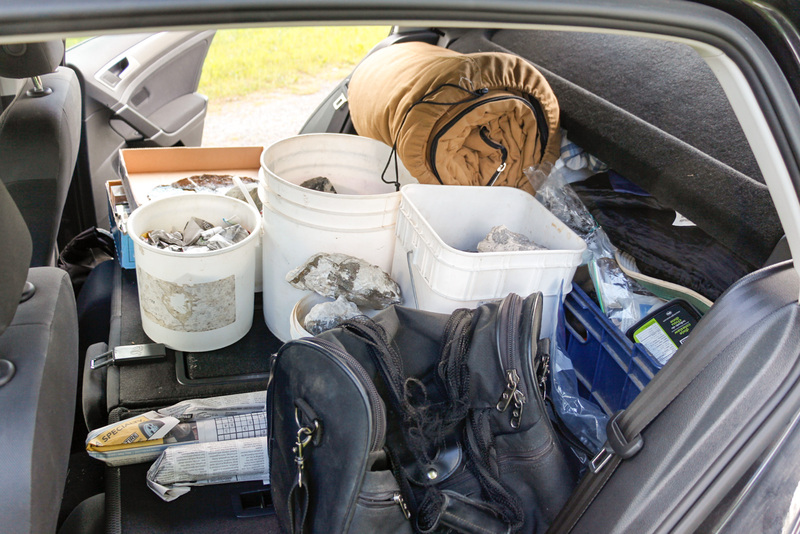 Minerals from Cobalt in the back of our car. 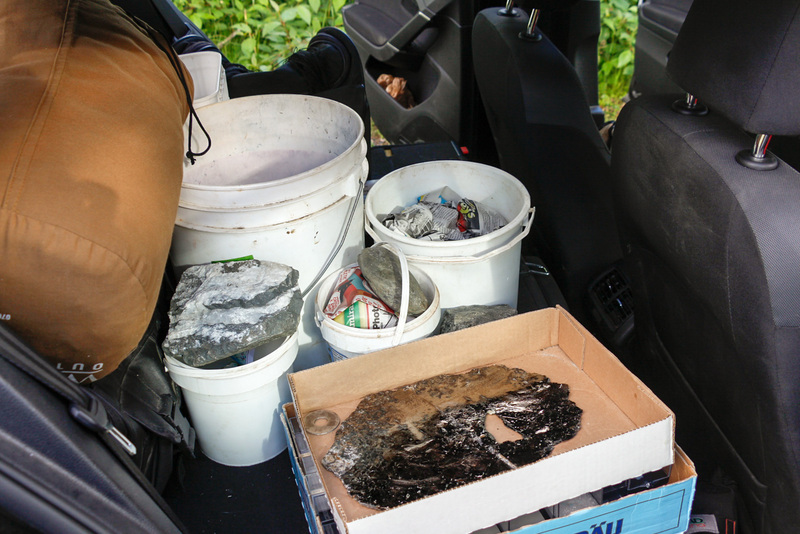 The next morning, we packed up the car, and only then did I begin to realize the variety of rocks we had collected. Along with the asbolane and silver, Reiner also sent me home with a bucket of cobalt that I hope to make into blue pigment, more annabergite for green, and even some stunning hackmanite from Bancroft (for my upcoming project at Nuit Blanche 2017 in Toronto). As well, Manny ended up with a whole host of new rock samples for his collection. As we packed, our car became full of treasures. On our drive home, Manny and I shared stories of what we had seen. He felt that his first silver hunting trip had been a success, and loved the experience of sleeping in a Bunkie. I was also excited about the rocks I was bringing home, but also had enjoyed reconnecting with friends. As someone who connects the land and its stories in pigment colours, the trip had also been enriching for my artwork. I can’t wait to work with these new local colours! A special thank you to Reiner and Maggie for their hospitality and for sharing their passion of Cobalt with us during our visit. I am deeply appreciative to both of you for your support of my art and for enriching the life of my family. Symeon and Manny sounds like a wonderful adventure. Manny glad you found your silver.